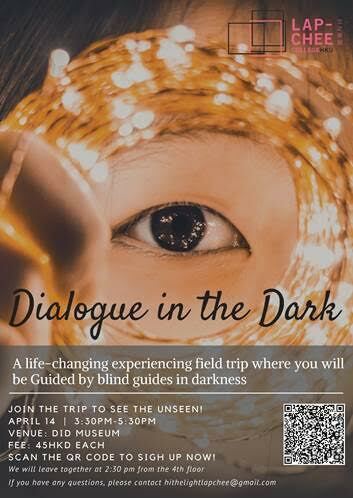 You are warmly welcomed to join the field trip to Dialogue in the Dark Experiential Exhibition organized by V2V program of Lap-Chee College. For those who have successfully registered, we will set up a booth at room 401 to collect the ticket fee. There are two sections, Apr. 5th and 6th 9:00 p.m.-10:00 p.m. Cash only. People who fail to pay for the ticket fee will be automatically regarded as absence, and the quota be given to the next person in line. Our Exhibition gives you an experience like no other. In this specially constructed pitch-black exhibition, visually impaired guides lead the sighted to ‘see’ the world in a unique and inspirational way. Get ready to discover the parts of Hong Kong that you have never seen before. And give your eyes a rest as you immerse into complete darkness. In the tour, you will visit five different, authentic settings. Each environment has its own unique texture, sound, smell and even taste. Be prepared to have your senses heightened as you explore these foreign yet familiar places without the help of your eyes. Our professionally trained visually-impaired tour guides will be leading you through the 75-minute tour. In the dark, your roles will be reversed – the sighted will be led by the visual impaired. We hope that through your exchanges with your tour guide, you will be able to appreciate the world without light, and learn that even without vision, the world is still a beautiful place. The dark exhibition is a unique and unforgettable journey that brings you not only fun, but also excitement. We hope to challenge your perception towards the visually-impaired, and towards the way you use your sense in your daily life. Please feel free to email us if you have any question or concerned.